Political philosopher Michael Sandel — the second “Michael from Harvard” this session — returns to TED in the last session of TEDGlobal, “All Together Now,” to address the marketization of our culture. These days there’s very little money can’t buy. If you ever wind up in jail in San Diego, CA, and you find your cell uncomfortable, don’t fret; simply pay $82 and you’ll be upgraded. Or if you find yourself in Washington, DC, en route to a Congressional hearing, but you hear that the line is around the block, don’t give up; you can pay someone through a line-standing company to wait in line for you. You just have to show up at the last minute and take your seat. In the past three decades, says Sandel, we’ve undergone a quiet revolution, drifting without realizing from a market economy to a market society, where almost everything is up for sale. In a market society, market values dominate every aspect of life: personal relationships, family life, health, education, politics, law, civil life. Why is this a problem? According to Sandel, two reasons: First, inequality. As money becomes important to access to the essentials of the good life — decent healthcare, the best education, political voice and influence, etc. — inequality becomes more and more important. And the second reason is that when market thinking and values enter the sphere of certain social goods and practices, they change the meaning of those practices — and crowd out attitudes and norms worth caring about. Sandel gives the example of cash incentives in schools. Some schools in New York, Chicago and Washington DC have begun programs to motivate students from disadvantaged backgrounds by offering money for grades: $50 for an A, $35 for a B, and so on. A program in Dallas offers students $2 for every book they read. Sandel, famous for engaging his students in lecture, asks the audience whether, as the head of a major school system, they would consider experimenting with cash incentives. Most of the audience votes against the incentives, but there’s also a sizable number in favor. One attendee, Heike Moses from Switzerland, says this kills intrinsic motivation for students to want to learn and wonder about the world. What happens when you stop paying them? From the audience, Elizabeth Loftus, who spoke on Tuesday about the fiction of memory, says, “Why not try it?” She is in favor of experimentation, saying she would measure how many books students read while she paid them and after she stopped. Indeed, says Sandel, that’s what experts disagree on as well: Will cash incentives drive out the higher motivation, to learn and read? It turns out the cash for good grades programs had very mixed results, while the $2 to read books was successful. Sort of. Students did read more books — but they read shorter ones. What this illustrates is a false assumption held by many economists, says Sandel: that markets are inert and don’t taint the goods they exchange. This may very well be true with material goods, but not so with goods like teaching, learning, engaging in civic life. Market thinking can actually change the character of these social practices, so we have to really think about where markets belong and where they don’t. But this debate may never happen. 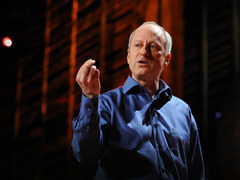 As Sandel says, “Over the past 30 decades, as market reasoning has gathered prestige, our public discourse has become hollowed out and empty.” Public discourse and collective reasoning about the value and meaning of the social practices we prize is deteriorating, as we shun controversial questions for fear of disappointment. The problem of market thinking, says Sandel, is the illusion of commonality against the backdrop of rising inequality. Marketizing every aspect of life leads to a condition where those who are affluent and those who aren’t live separate lives — and this is terrible for democracy, says Sandel. Though democracy doesn’t require perfect equality, it does require that citizens share in a common life, brushing up against different social backgrounds and people from different walks of life. This is how, he concludes, we come to care for the common good. Which is something money can’t buy, and can actively work against. The comment about following-out of discourse is most apt. Everything is about the sound-bite, about quick fixes for complex social problems. We seem incapable of communicating a long term vision. Great talk. Thanks TED! A pithy post with delicate handling of a thorny subject. Thumbs up!